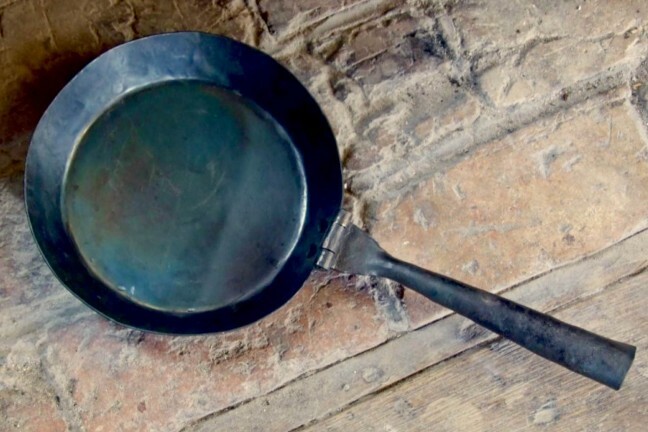 More niche kitchen products you don't think you need...at first. In Part 1 of this series, we featured a handful of niche kitchen items you don’t exactly need…until you do. Today we’re continuing that line of thought with a few more products that you could do without, but will still make your life a bit easier in the end. 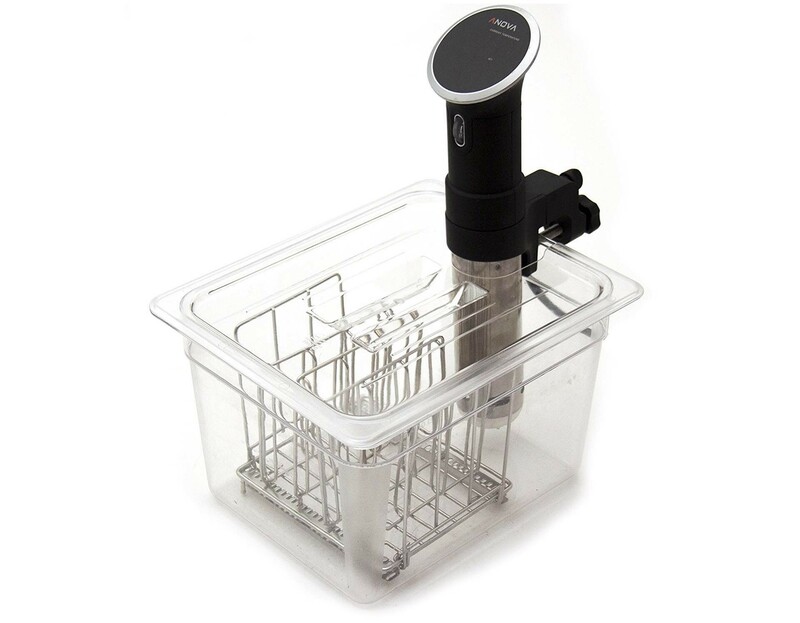 When you first dip into the world of sous vide cooking, you’ll often find people recommending that you use a restaurant-grade polycarbonate container just for the purpose. While you can use pretty much use any container you have around, assuming it’s large enough and you have a place to clip the cooker onto — you could even use a sink if you wanted, but ugh — polycarbonate ones are popular because they’re 1) light yet sturdy, 2) see-through, 3) fairly well-insulated, and 4) relatively affordable. 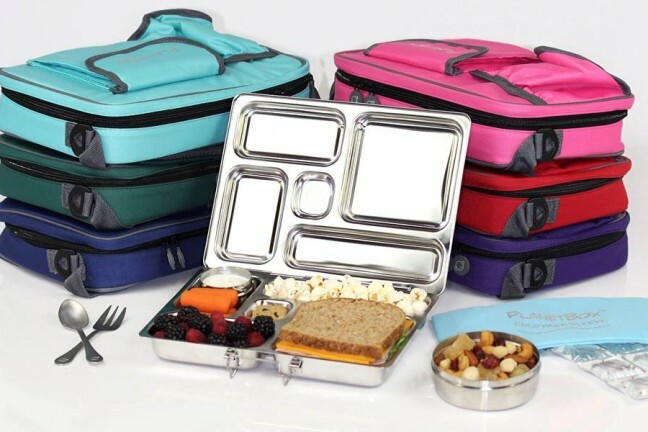 A note on BPA: Polycarbonate containers, by their nature, do contain trace amounts of BPA. You needn’t worry too much about that; the amount is extremely low, to the point of being negligible, and your food shouldn’t be coming into contact with the plastic or water anyway if you’ve sealed it well enough. Just be sure to use BPA-free bags if you’re that worried. Here’s the lid for the Anova cooker. Here’s the lid for the ChefSteps Joule cooker. Here’s the lid for the Sansaire cooker. Here’s the lid for the Nomiku WiFi cooker. 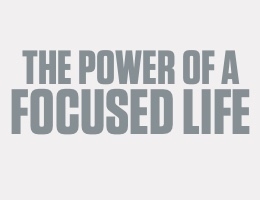 …and they have more options where those came from. For times when you’re cooking multiple items at once, you can also employ one of Lipavi’s sous vide racks to keep the pouches far apart enough to ensure they all have proper circulation. The rack fits perfectly alongside an immersion circulator. 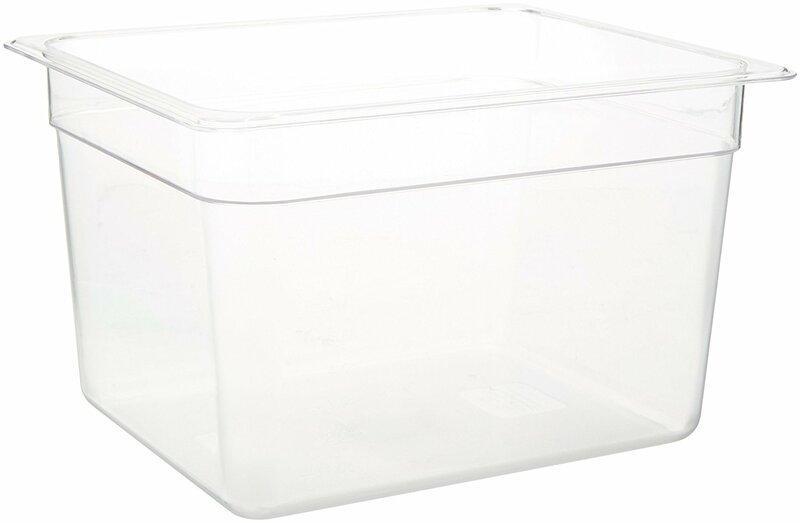 7-quart ($19) — Great for smaller households. 12-quart ($24) — Recommended option for most use-cases. 18-quart ($29) — Designed for larger households. 26-quart ($41) — Useful for parties and other events. 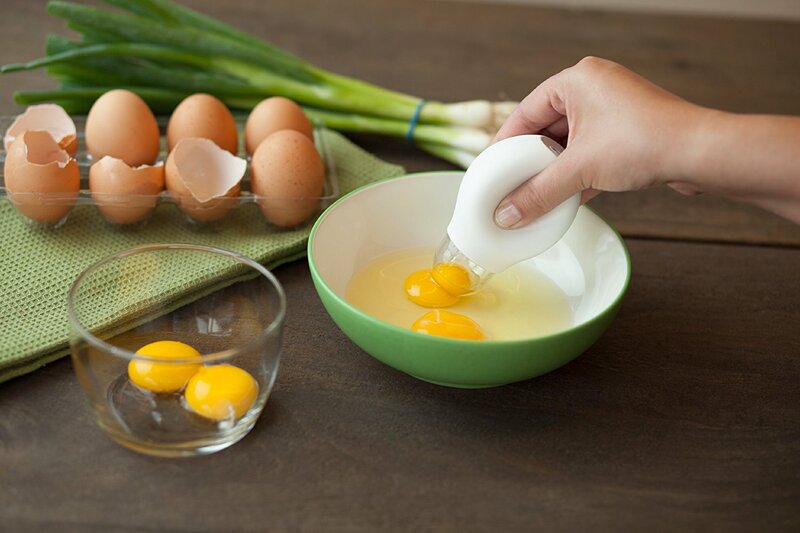 If you’re the type of home cook or health nut who finds themselves separating eggs a lot, the “Pluck” yolk extractor by Quirky will make it a super easy and clean process for you. Just squeeze the silicone part, place the tube onto an already cracked egg, and release. It schlurps the yolk up, leaving the egg white(s) behind, and you can then squeeze the yolk back out elsewhere. As a bonus, the yolk makes a great (and healthy!) dog treat. The geometric “Inside Out” wood trivet is one of those things where you won’t be able to decide whether to use it for its intended purpose or hang it on a wall. Handmade from natural birch plywood and in the form of a curved, continuous line, it’s a charming place to set hot objects — kitchen pans, tea/coffee kettles, coffee cups, etc — and thus protect your tabletop. Use one alone or have a line of them running across the table as an ad hoc “hot stuff” surface. The Gretel Home online shop offers both the small ($24) and large ($32) versions of the trivet. Both are available in natural and black colors. All-natural peanut butter — the kind where only roasted peanuts and salt need apply — is objectively the most delicious variety (don’t @ me), but it does separate in the jar after a while and can be a pain or even a mess to stir back together. That is, until we discovered this clever peanut butter mixer. 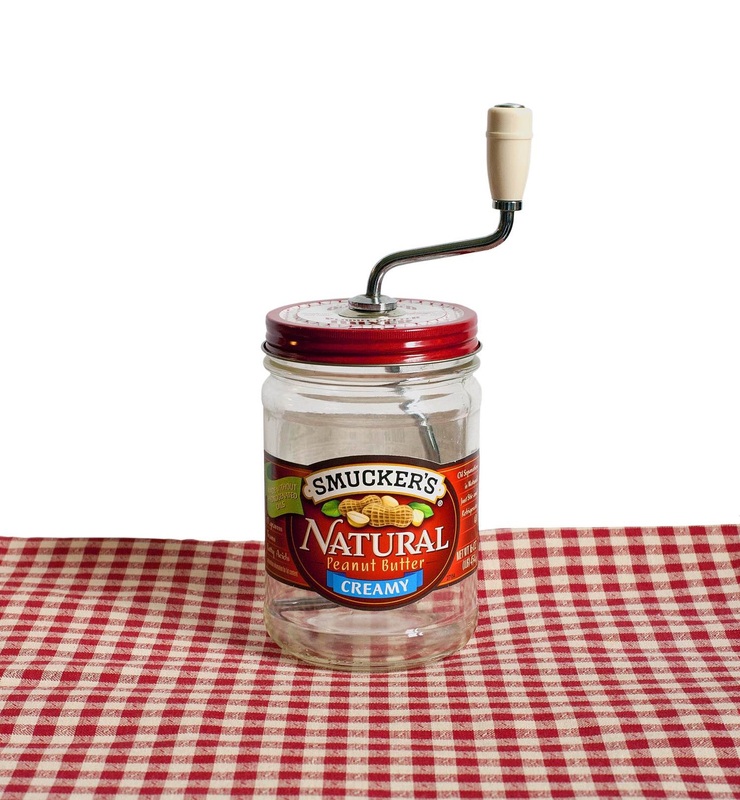 It’s a curved mixing rod that pokes through a “lid” assembly, which then affixes onto a peanut butter jar of matching size. The process is easy: Assemble the mixer, turn the crank until everything is mixed well, then pull the mixing rod out of the lid, clean as a whistle. Small ($14) — For 16-ounce jars with 2.75″ lids. Regular ($12) — For 16-ounce jars with 3″ lids. Large ($13) — For 26-ounce jars with 3.25″ lids. Another clever invention along these lines is the upcoming PBSpoon, which we featured here when it was still a Kickstarter project. Objēo’s complete dishwashing set brings a bit of chic modern design to an otherwise mundane chore. 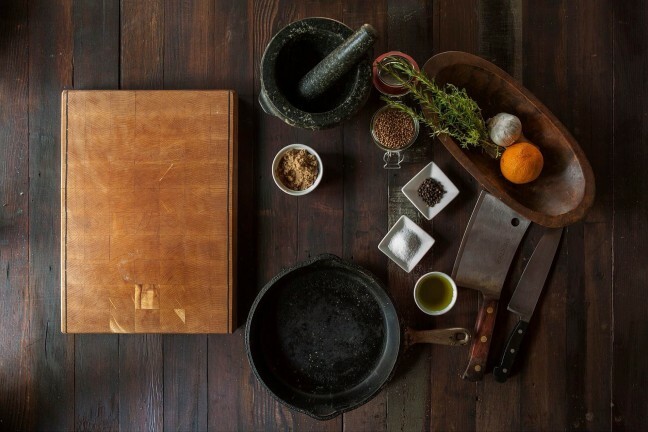 It has three main tools — a dish brush, a sponge, and a scrubber — each of which can be used with or without the separate wooden handle attachment. 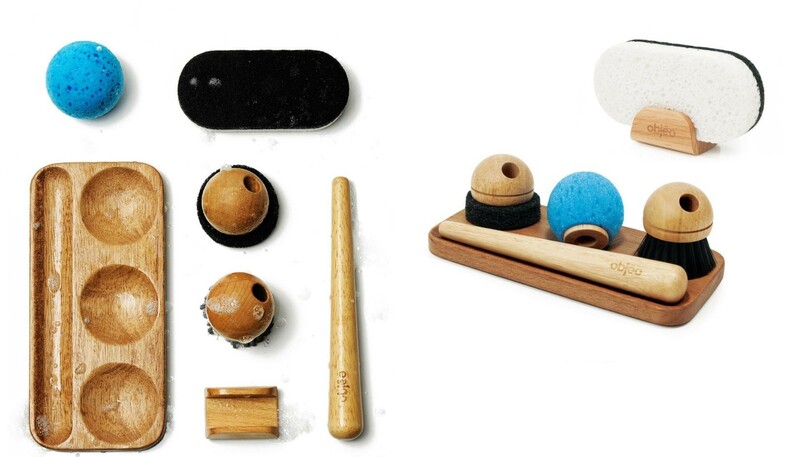 All of these items fit into an accompanying mancala-like stand, and the set comes with an additional three larger, two-sided sponges that are soft and absorbent on one side and abrasive on the other. A small included stand holds one of these sponges upright at a time. It won’t be too long before it’s that time of year for concocting homemade fruity drinks like strawberry soda or watermelon agua fresca to help ward off the summer heat. In the former beverage’s case, carefully cutting out all those strawberry stems with a paring knife — and without wasting precious strawberry flesh — gets tedious after a while. The StemGem by Chef’n makes this process way easier. 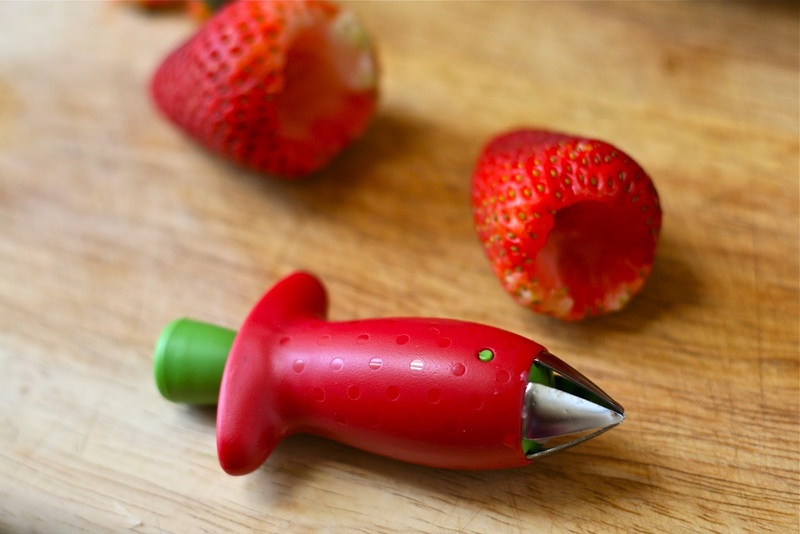 All you do is press the green button to open the claw at the other end, insert the claw into a strawberry, twist, then pull. The stem comes out cleanly, leaving an intact strawberry ready to be sliced, boiled, blended, used as a garnish, served at a party, or simply eaten right there on the spot.